As I am trying to get rid of my UFOs I’m also thinking quite a bit about motivation. Why did I stop working on so many projects somewhere midway? Why did I start so many other projects in between (and didn’t finish those either)? What made me lose motivation? At the start of each project I was really excited about that particular project. About the pattern, the fabric I was going to use, the construction details. And yet, some of those really exciting projects have now been waiting in a plastic bag for ages until I pick up the courage to finish them. It made me think of a graph I saw in a newspaper years ago. I don’t remember the details, but I think it was a short report on a research paper in which they had studied people’s motivation during a task or project. I’ve tried to find it but couldn’t so I’ve reproduced the figure from memory and added some extras, just because I could. The conclusions were very simple really. At first, people are very motivated to work on a task/project. To keep it sewing related, when you discover a new pattern that you really love, you’re eager to find the perfect fabric and matching notions and to just start sewing. Then, after a while, your motivation slowly starts to wane. Progress is not as fast as you had hoped, there might be some setbacks (unpicking, anyone?). So, halfway through you’re thinking you’re never going to get this thing finished ever, and motivation hits an all-time low. Then, at some point, your motivation slowly begins to increase as you start to see that it is actually starting to look like a real garment, that it might in fact turn out nice and something that you’d like to wear. Close to the finish line, motivation sky rockets and the project is finished quickly. For me this is very true and not just for sewing related tasks. It is something that I should learn to recognize and fight. Especially in the middle stages when a project or task becomes sort of boring, I should remember how nice it makes me feel to finish something and not succumb to the lure of the shinier project. 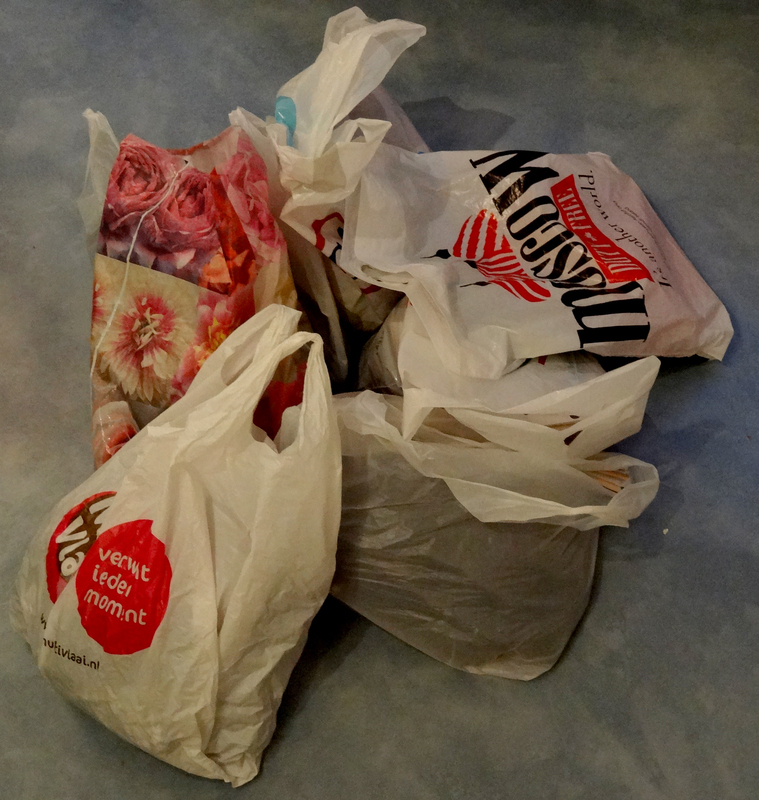 Do you recognize these fluctuations in motivation when sewing? This used to be an UFO, now it is a baby top! 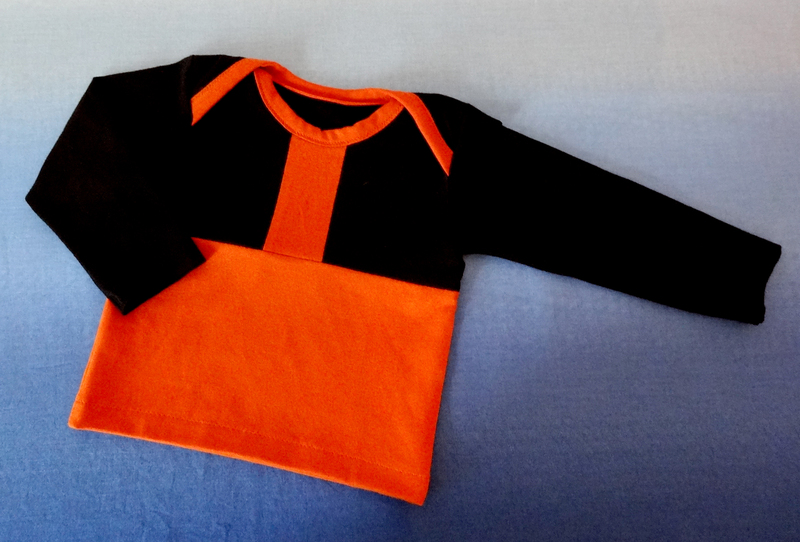 This is what was left of the original top after I cut out the fabric for the baby tee. Unfortunately, I forgot to take a picture of the original top before cutting into it. The neckline was so messed up and screamed homemade in a bad way that I would never wear it. In fact, all of the problems that I had with this top involved the neckline. I made several stupid mistakes during the construction and had to unpick so often that it caused multiple holes in the fabric because the stretch stitch that I used was a complete nightmare to unpick (nowadays I use a simple zigzag stitch when sewing with knits which truly makes a world of difference). On top of that, the fabric got eaten by my sewing machine several times creating even more damage (wish I’d known about holding the thread ends when you start a seam, would have saved me tons of frustration). I also realize now that I used completely the wrong type of interfacing to reinforce it. The upper left picture shows some of the hideous topstitching. 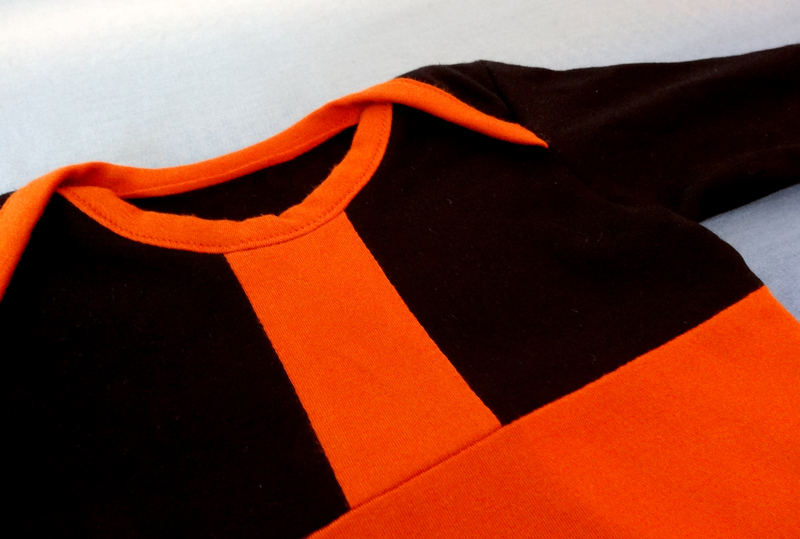 The other two pictures show the inside of the neckband. You can see how much thread issues I had. The fabric also somehow ended up twisted in several locations. Could I have fixed this top to get it up to my current standard? I didn’t have any fabric left to redo the neckline. Buying more fabric also wasn’t an option because the solid knits from Hilco have changed slightly since 2010 (not just the colour but also the feel of the fabric) so I would have had to redo the entire top to make sure it looked good. And well, making a whole new top wasn’t really going to solve this UFO situation that I had going on with the original top so no, I couldn’t fix this top. I couldn’t just throw this project in the bin though. The fabric is a really nice and soft viscose and lycra blend that didn’t come cheap. Enter my decision to get rid of all my UFOs. I realized that it would be totally all right to turn anything that I no longer want into something else! So, what would be the best way to turn this now unwanted top into something desirable? The original top was made up of quite small pieces of fabric which made it difficult to turn it into another garment for myself. 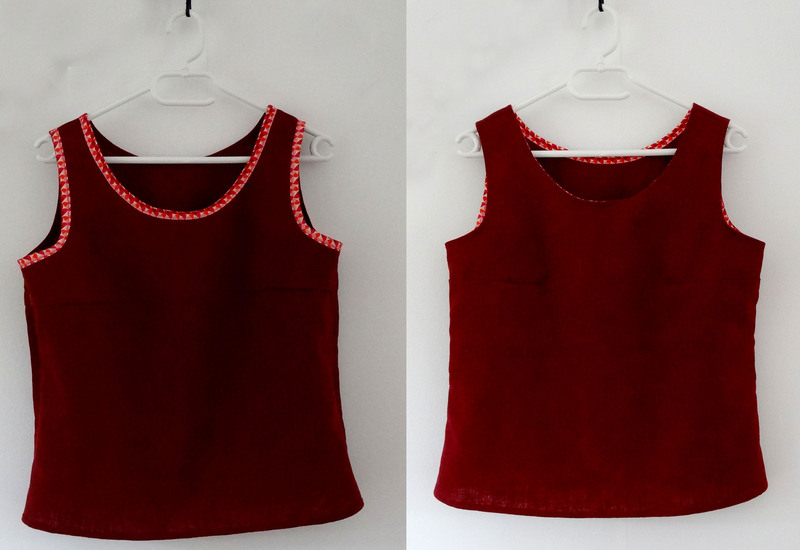 A baby top, however, is much smaller and this fabric is absolutely lovely for babies because it feels so nice on the skin. I absolutely love the colourblocking on the front of the t-shirt. I decided to make the envelope tee size 6-12 months from Meg McElwee’s book “Growing up Sew Liberated”. I love this pattern and have already made it several times. It is a simple pattern but easy to customize and I think it makes a great gift. In order to fit the front and back pieces out of the UFO fabric pieces I had to cut up the pattern. This gave me the opportunity to create a colour blocking effect (actually very similar to what I had planned in the original top). This is very much my style and I think it gives the t-shirt a sporty appearance. In the picture below you can see how I adapted the pattern to achieve this look. Schematic representation of the adaptations that I made to the front and back pattern pieces of the envelope tee size 6-12 months from “Growing up Sew Liberated”. I consider this UFO properly busted because I ended up with a great looking baby top that makes me smile by only looking at it, while the old top made me cringe. It also made me realize that my sewing skills have really improved since 2010. I don’t think this top would have given me so much trouble had I tried to make it now. 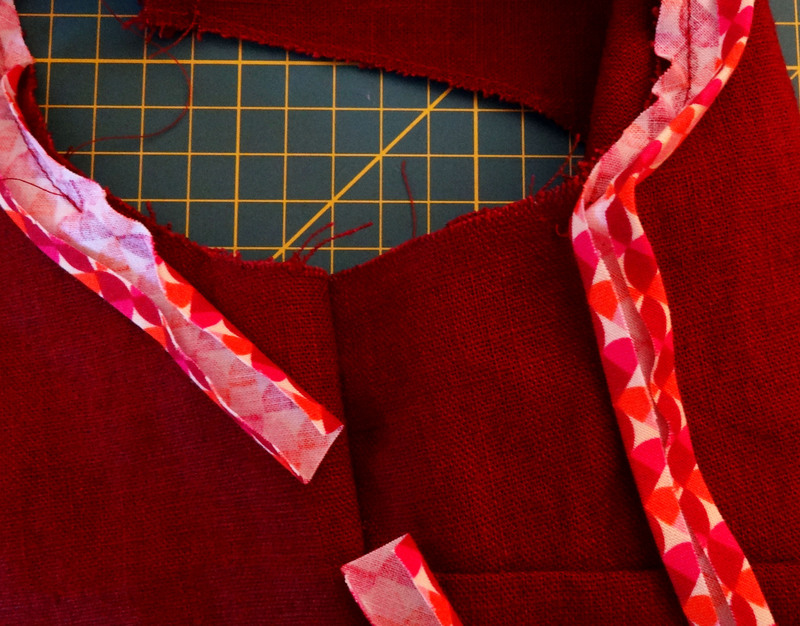 Have you ever hacked up a messed up project to make something else with the fabric pieces? Most of us have them, unfinished objects (UFOs). I’ve decided to do something about mine. There are several reasons why one of my projects suddenly turns into an UFO. I mess up and it seems beyond repair. There might be holes due to too much unpicking. I might not have enough fabric left to recut a messed up pattern piece. These are the complete drama UFOs that make you want to cry and throw the project against a wall or your sewing machine out of the window. I mess something up and have to unpick a lot before I can continue (did I ever tell you how much I dislike unpicking? If I could buy a machine that would do this for me, I totally would). Halfway through I realize the garment is not going to fit or flatter me at all. I reach a point in the construction where I can’t continue because I didn’t buy any lining fabric/buttons/zippers/quilting thread etc. I reach a point in the construction where I simply don’t understand what the instructions want me to do next so I get stuck. I just get bored and want to make something else that is more appealing. Some of my UFOs, do you see their accusing glares? At any of these points I’ll simply shove the project into a plastic bag and store it somewhere in a closet or a corner of my sewing room until I feel like finishing it. In truth these projects can sit untouched for years, taking up valuable storage space. They sometimes make me feel a little guilty because I already spend money on the fabric and if I can’t show something for it that was a complete waste. Some of these projects wouldn’t even take that much time to turn them into a finished object so it is kind of stupid that I do not just get on with it. I want to get rid of these UFOs and stop creating any new ones. From now on I am going to allow myself only one work in progress (WIP) in the following 4 categories and and I have to finish the project before starting a new one. 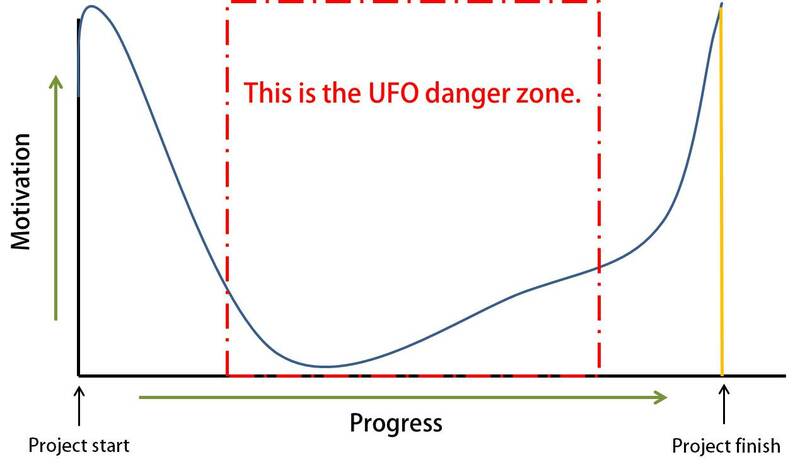 I do realize that allowing myself multiple projects is potentially dangerous but if I stick to it I´ll only have 4 UFOs at most, which I promise you is much, much, better than the current situation. 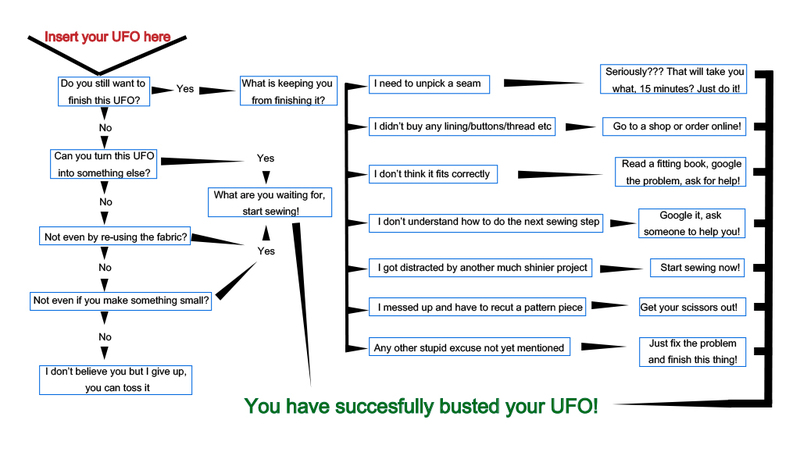 UFO busting flow chart. Click on image to view larger version. How is your UFO situation? Manageable or spinning out of control? Would you like to join me in some UFO busting? Cut the end of the fabric strip at an angle. When you think about it, this is not all that surprising, but seriously, this tip can save you lots of frustration! 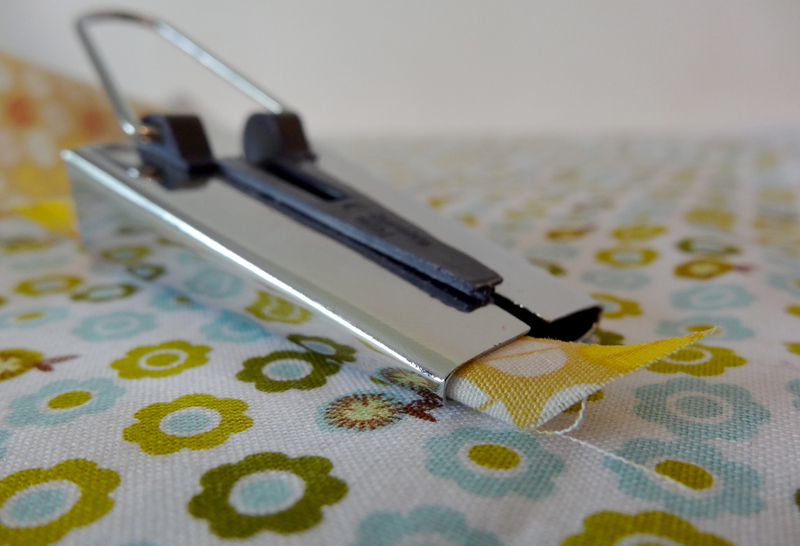 The small tip of the fabric strip won’t meet much resistance inside the bias tape maker, and once the tip peeps out of the front, it is really easy to pull the rest of the strip through. No more fussing around with a pin trying to pull the fabric through. When the tip of the strip comes out of the front you can easily pull the rest of the strip through. For those of you that are not familiar with bias tape makers I’ll also show you in more detail how to use them. A bias tape maker is, as the name suggests, used to make bias tape. 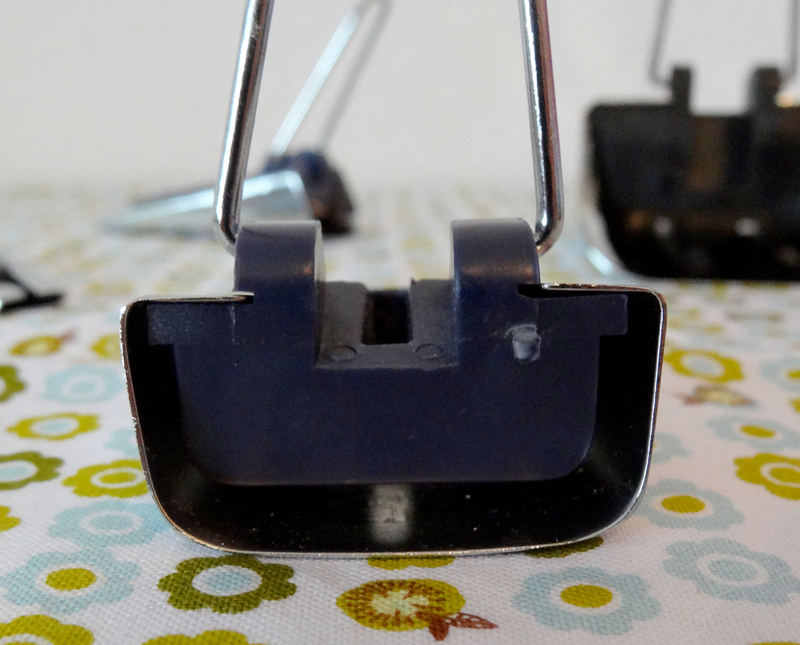 I think they’re nifty devices that are a very useful addition to your sewing room. They’re not very expensive and come in (at least) 5 different sizes, 6 mm (1/4’’), 12 mm (1/2’’), 18 mm (3/4’’), 25 mm (1’’) and 50 mm (2’’). I own the 4 largest ones. Making your own bias tape has several advantages. You are not limited by the colours of store bought bias tape. You can use much nicer fabrics for your bias tape (store bought tape is usually very stiff) and you can make your garment look really unique by using a special print. My bias tape makers, don’t they look pretty all lined up? The instruction leaflet that comes with the bias tape maker will tell you what size to cut the fabric strip but roughly this will be more or less twice the width of the finished width of the bias tape. 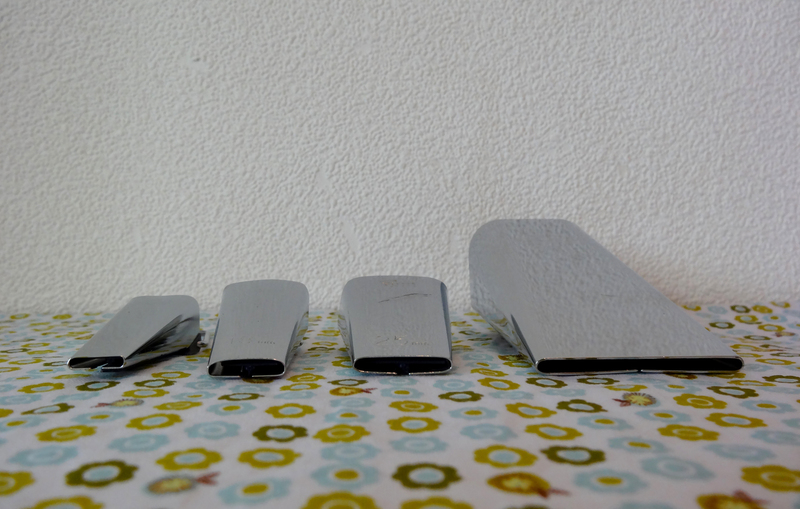 For the really small bias tape makers it will be a little bit more, for the larger ones a little bit less. For the following pictures I used the 25 mm bias tape maker and cut my fabric strip just under 50 mm wide. 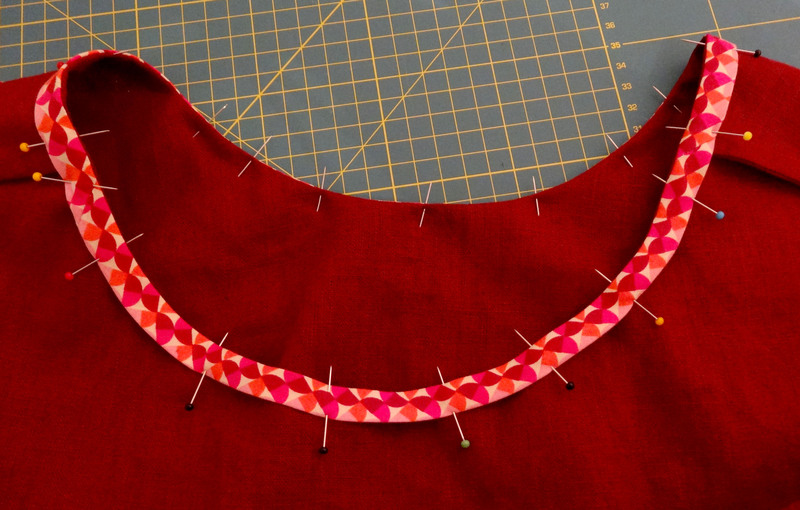 The fabric strip is usually cut on the bias (45 degree angle to the grain line of the fabric). This gives the fabric a little bit of stretch and makes it easier to fit around curves. 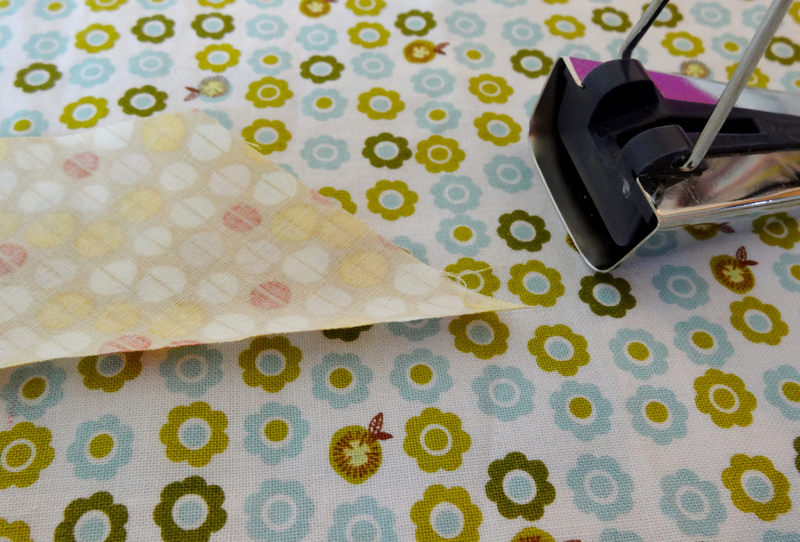 If you are going to use the tape to bind something that doesn’t have any curves it is totally ok though to use a strip of fabric that is cut on the straight of grain. The back of the bias tape maker is U-shaped. This is where the fabric goes in. When the fabric comes out of the front of the bias tape maker the edges are folded in. An iron is used to press the bias tape as it comes out of the bias tape maker. You can pull on the metal handle to pull more fabric through. That was easy wasn’t it? I hope I have convinced you that making your own bias tape is totally worth it! Inside (left) and outside of top finished with bias tape facing. 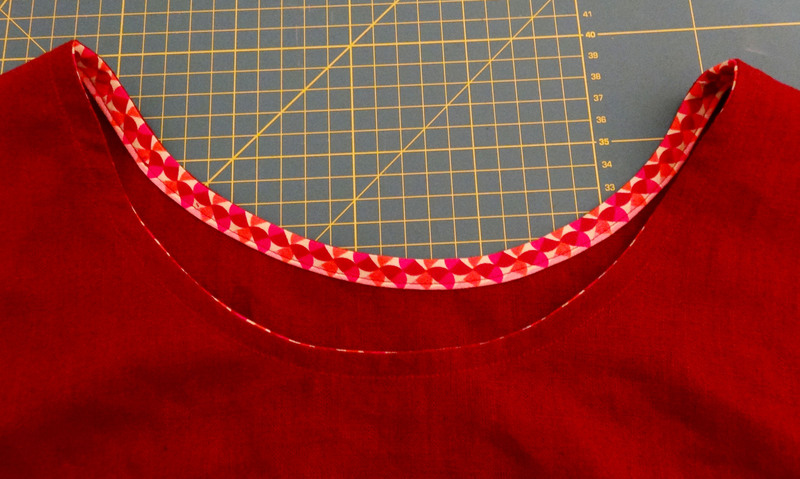 During the construction of my Sorbetto top I suddenly realised how I can guarantee that bias tape will fit perfectly in any armhole or neckline (or any other place where the beginning and end of bias tape meets such as bag tops, hems and quilts). Until now I was somewhat mystified by how to do this properly and usually managed to fit it by a process of trial and error. Not anymore! It turned out to be very easy and since I am guessing that I am not the only one who could do with some clarification on this topic I thought I’d share my newfound knowledge in my first tutorial. I prefer to match up two ends of bias tape with a seam that is at a 45 degree angle with the length of the tape instead of a 90 degree angle. 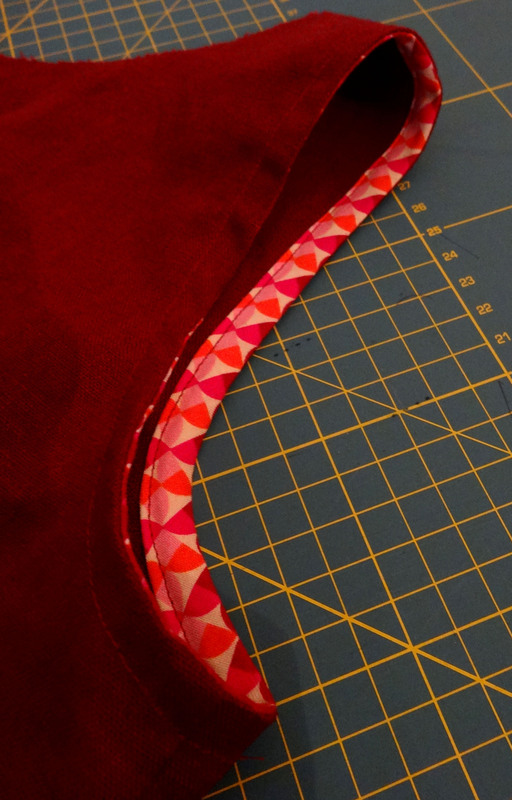 A huge advantage of having a seam that is at a 45 degree angle is that it will create much less bulk when the tape is attached to the project, especially when the bias tape is used to encase a fabric edge. 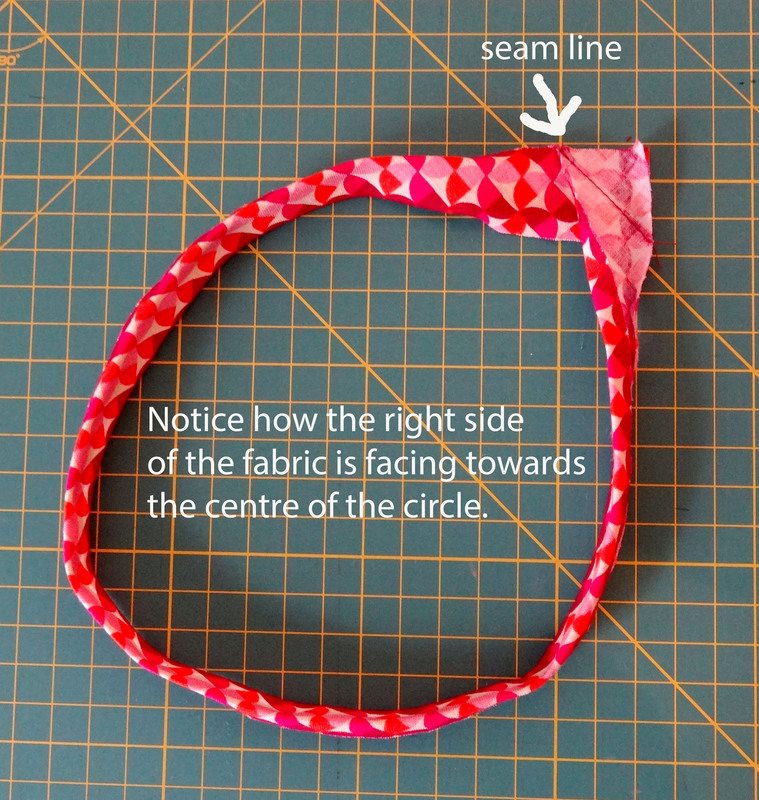 I also think that a 45 degree angle seam will be more stable because this seam will run parallel to the grain line of the fabric since the fabric from which bias tape is made is cut on the bias. The problem though with the 45 degree angle is where exactly to sew this seam to ensure that the tape will fit your opening perfectly and this is what I am now able to explain to you. I figured it out while trying to apply a method for attaching a binding to a quilt to the neckline of the Sorbetto and failing miserably. The bias tape turned out much too long. 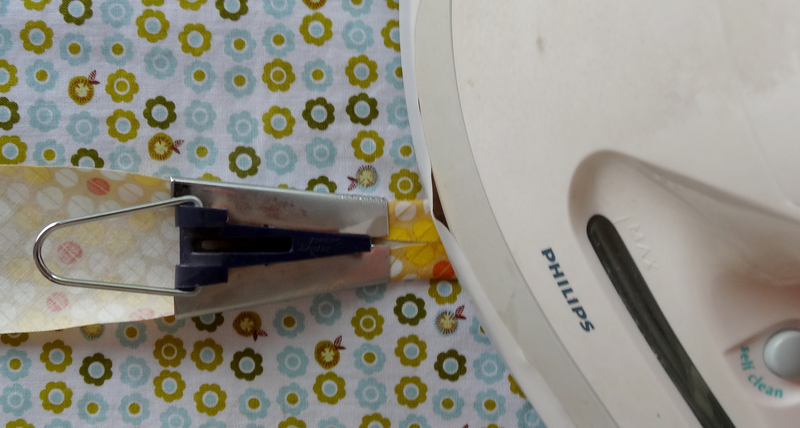 Then in a true light bulb moment I realised that for the quilt binding I had to add 5 cm (2’’) to the length of the binding at a certain point because the unfolded binding strip was 5 cm wide. The fabric strip I used to make my own bias tape for the neckline was only 2.5 cm (1’’) wide so that is why I ended up with a much too long strip to fit my neckline. When I added 2.5 cm instead of 5 cm my bias tape suddenly fit perfectly! 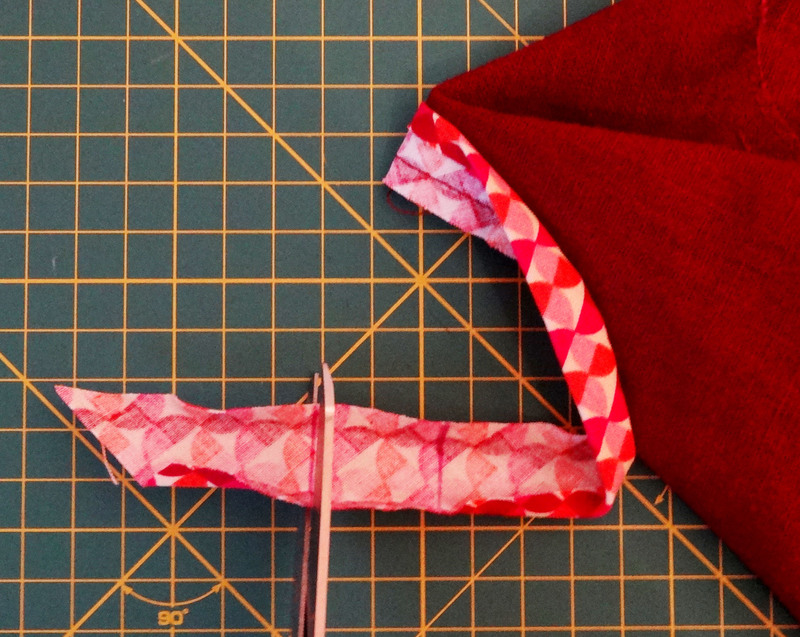 How to match up two ends of bias tape to sew the 45 degree angle seam. 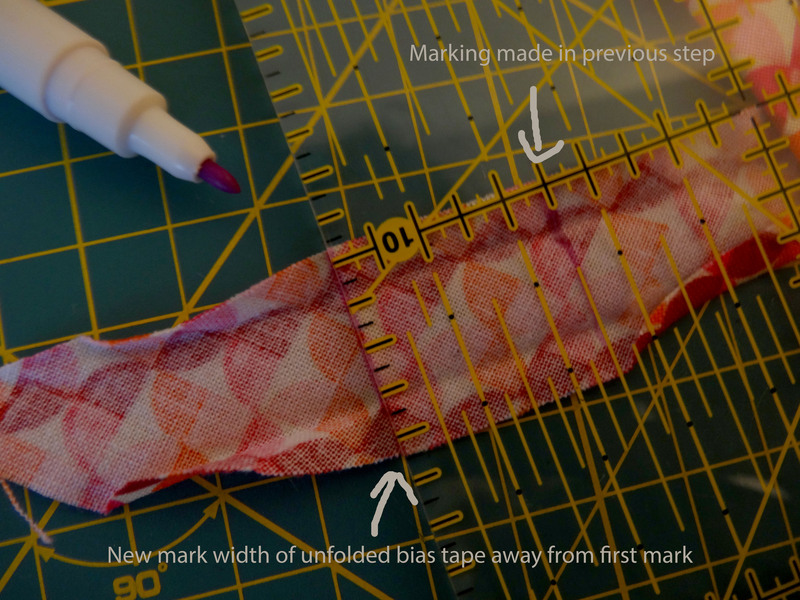 I made another Sorbetto to demonstrate two methods for creating perfectly fitting bias tape. In sewing there are usually several ways to the same end result and it’s up to you to figure out which method works best for you. 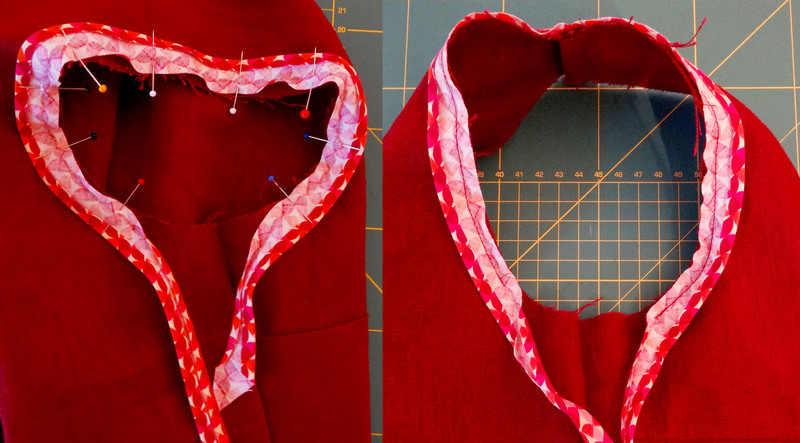 For the top in this tutorial I used bias tape to create a facing on the inside of the garment, but these methods can also be used to create an outside facing or for encasing a fabric edge in bias tape (which I think is what bias tape is used for most often). Please note that this tutorial is only to be used with woven fabrics. When attaching stretch bias tape to knit fabrics other rules apply. Step 1.1: Make your own bias tape or get a piece of store bought tape that is a little longer than the opening you want to attach it to. If this is the first time you are attaching bias tape to an opening I suggest that you make it at least 10 cm (4’’) longer. 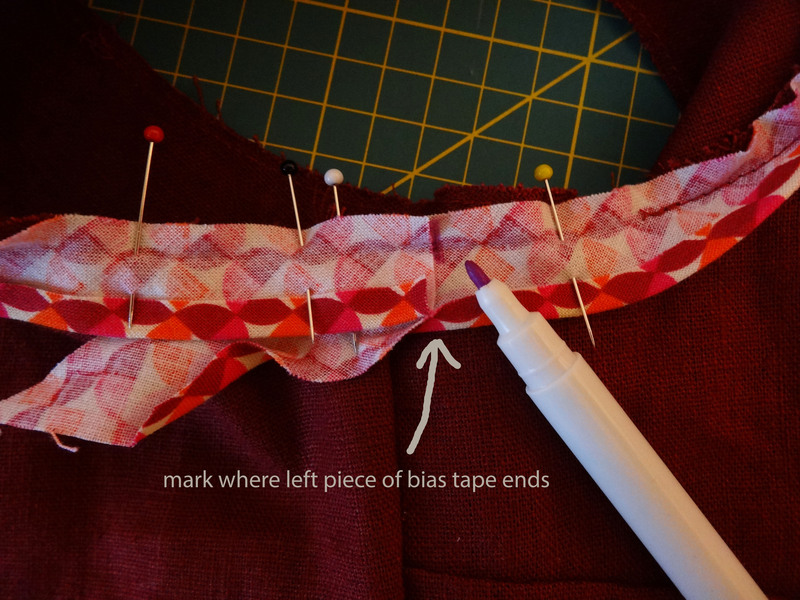 Step 1.2: Pin the bias tape to the opening, leaving the ends of the tape trailing off. I try to make sure that the place where the seam will end up is in a spot where it is hardly noticeable, such as under the arm when attaching the tape to an armhole or near the shoulder seam when attaching it to a neckline. I wouldn’t match it up exactly with another seam though as this will create unnecessary bulk. Step 1.3: Stitch the bias tape to the opening leaving approximately a 10 cm/4’’ gap between the start and finish of your stitch line. Backstitch a couple of stitches at the beginning and end to secure. Step 1.4: Cut off the left end of the bias tape so that the end stops in the centre of the gap. This is not something that you need to measure accurately but your cut should be straight. Step 1.5: Align the right end of the bias tape with the gap. It might be helpful to use some pins to secure the tape if the opening is very curvy. 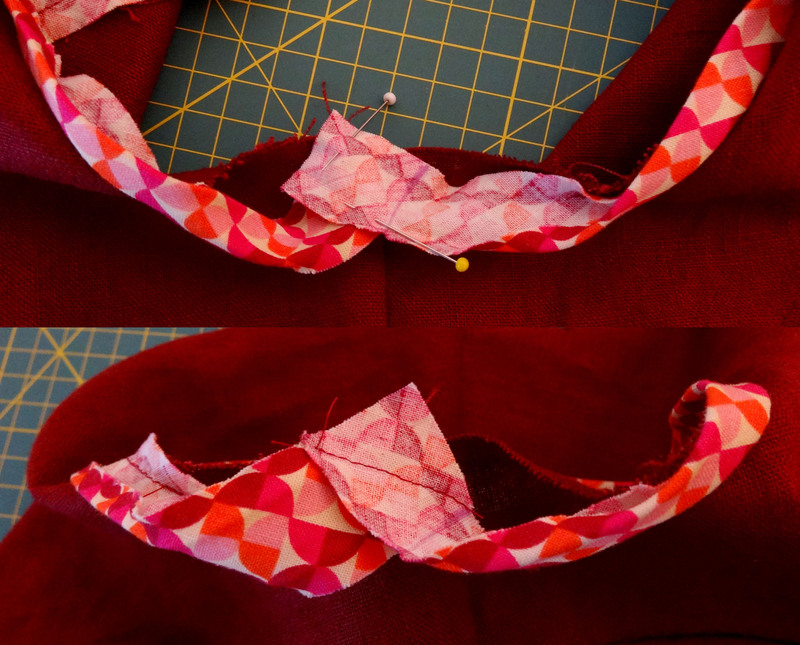 Step 1.6: Fold the left end of the bias tape over the right end. Mark on the right end of the tape where the left end stops. This is something that you do want to do accurately. Step 1.7: Now it is time to add enough length to the right end of the bias tape to be able to sew the 45 degree angle seem. The amount that needs to be added is the unfolded width of the bias tape. In my case this is 2.5 cm (1’’). Use a ruler (or a piece of the unfolded bias tape) to measure this distance on the bias tape. Draw a line across the bias tape to indicate where this measurement stops. Step 1.8: Cut off the right end of the bias tape on the second marking that you made. 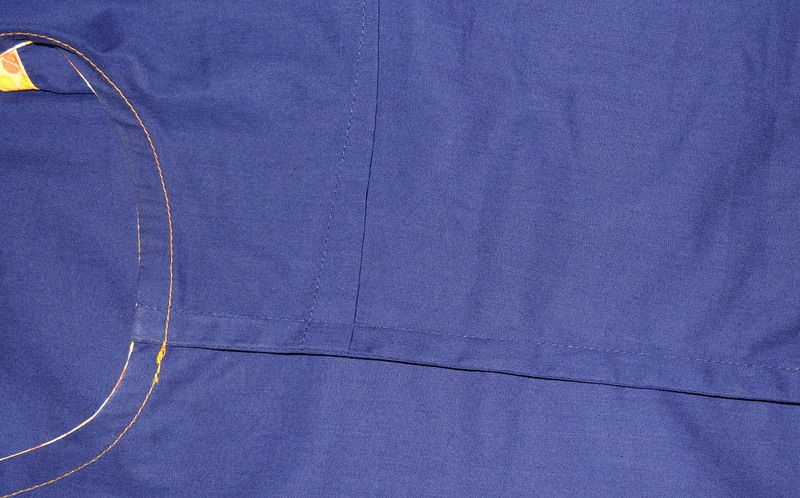 Step 1.9: Match up the edges of the bias tape as indicated in the picture and sew the two ends together as shown. It can be helpful to draw the line that you want to stitch with chalk or disappearing marker so you can sew on the line. After sewing the seam check whether you didn’t accidently twist the bias tape. Press the seam open and trim the seam allowances. 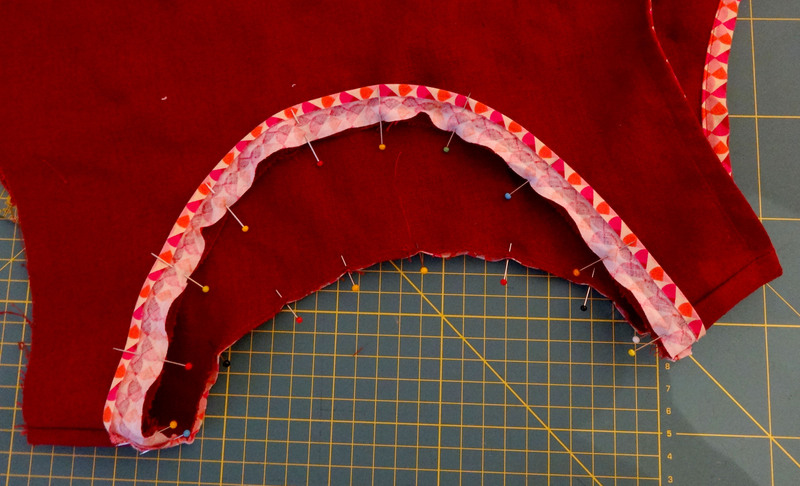 Step 1.10: Pin the bias tape to the gap and stitch in place. Step 1.11: Fold the tape over to the other side and edge stitch in place. You are done and should now have a lovely looking bias tape bound opening! Step 2. 1: Carefully measure your armhole or neckline and write down the measurement. This step is very important, if you do not do this accurately you run the risk that your bias tape will not fit as perfectly as you hoped it would! For the top that I used for this tutorial the neckline measured 75 cm. Step 2.2: To the measurement from step 1 add the width of your unfolded fabric strip or store bought bias tape. Write down this measurement as well. I my example I used 12 mm (1/2’’) bias tape, which was made from a 2.5 cm (1 inch) wide strip. So I added 2.5 cm to my measurement from step 1, which was 75 cm and ended up with a total of 77.5 cm. Step 2.3: Make your own bias tape or use store bought tape. Cut it exactly to the measurement that you wrote down in step 2. Do, however, slightly stretch the bias tape when you measure it. It has some stretch due to being cut on the bias and if you don’t stretch it out just a little bit, it might end up too long when you fit it into the opening. Step 2.4: Now it is time to create a circle with your bias tape. Match up the edges of the tape as shown in the picture and sew the two pieces together as indicated. Check whether you didn’t accidently twist the tape and ended up with a Möbius strip, which will be impossible to attach to the opening (this, of course, totally didn’t happen to me…). Press the seam open and trim the seam allowances. 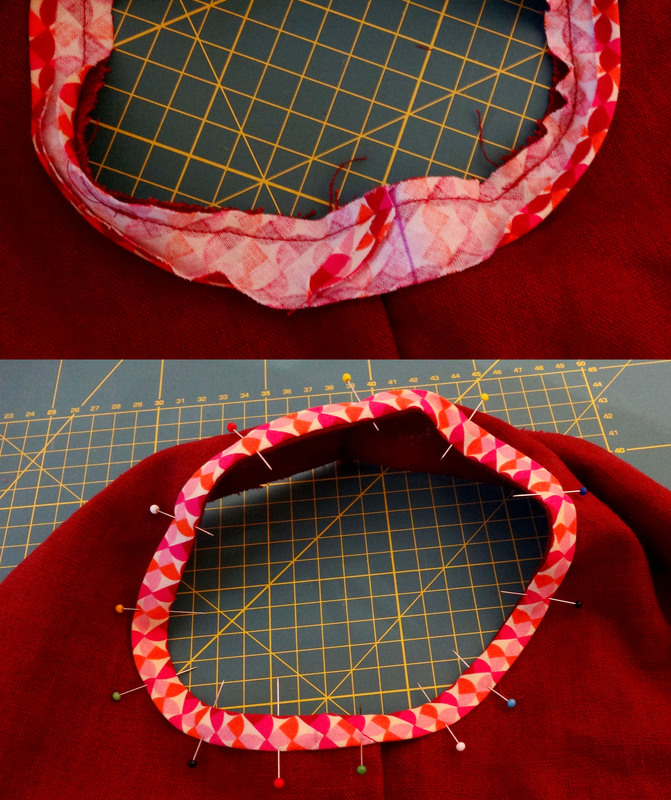 Step 2.4: The careful observer will notice that this is not the actual piece of bias tape that was used to face the neckline. I didn’t think my original picture was clear enough so I took another one with a shorter piece of bias tape. Step 2.5: Pin your bias tape to the opening and sew it in place. Step 2.6: Fold the tape over to the other side of the garment and edge stitch in place. I would love to hear from you whether you found this tutorial useful and which method is your favourite! Also, if you have any questions don’t hesitate to ask and I’ll do my best to help you. I came across the Sorbetto from Colette patterns while searching for a top that I would be able to squeeze out of a 60 cm long piece of fabric. The Sorbetto seemed to fit the bill perfectly as there are not too many details that take up precious fabric. The main fabric is a 100% extra combed shirting cotton from Tessitura Monti that I had left-over after making a classic tailored shirt for my brother. The cutting instructions for the Sorbetto tell you to fold the fabric once and then to cut both pattern pieces on the same fold. 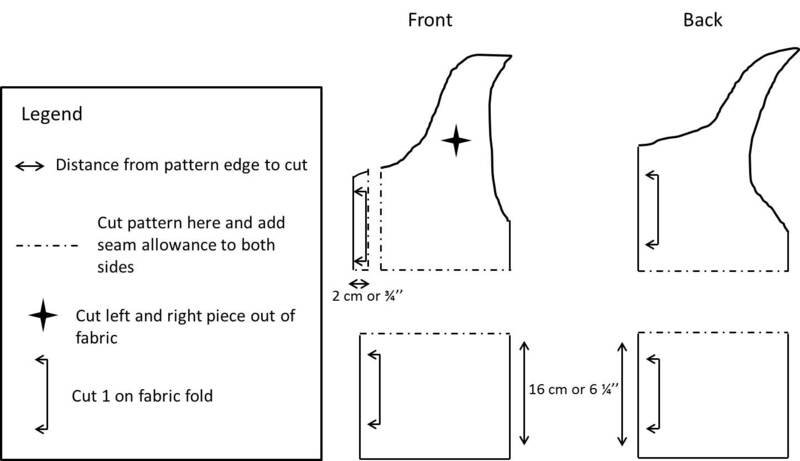 My fabric was 160cm wide and by creating two fold lines by lining up the selvages I had more than enough room to cut out both pieces from a piece of fabric that was a little over 60 cm instead of the 1.5 yard that is called for in the instructions. 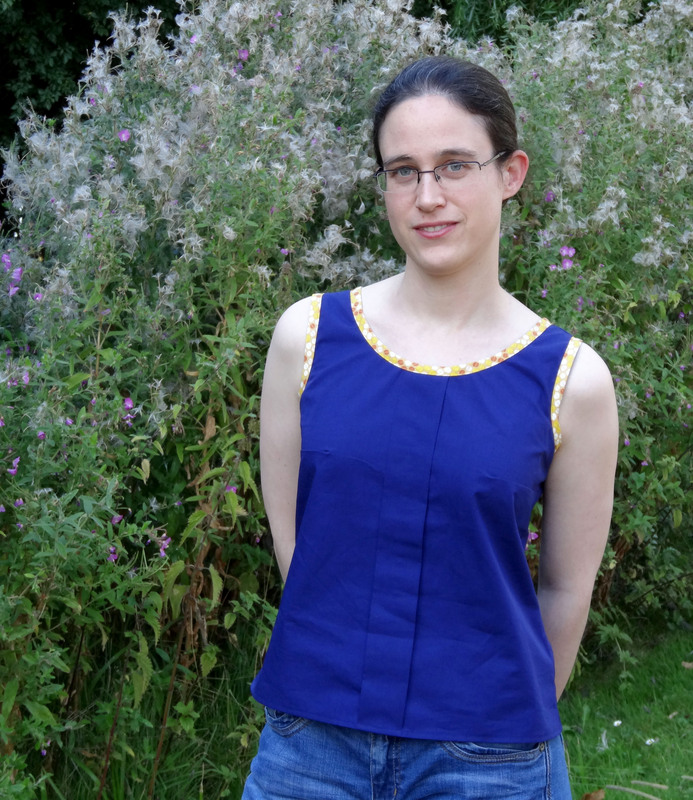 So, for the smaller sizes you can definitely make this top with less fabric! Unfortunately, I did not have enough fabric left to make my own bias tape. I intended to use store bought bias tape from my stash, but when I held it next to my good quality fabric it looked extremely cheap so that idea went out of the window. Just look at that edge stitching! Instead, I chose to use a quilting cotton from the Desert Daydreams collection of Anthology Fabrics to make my own bias tape with. Because the print is small scale it is clearly visible on the ½’’ bias tape and I feel this adds a nice detail to the top. I am also really happy with how my edge stitching on the bias tape turned out, it is probably the best I have done up until now. French seam on the inside of the top. 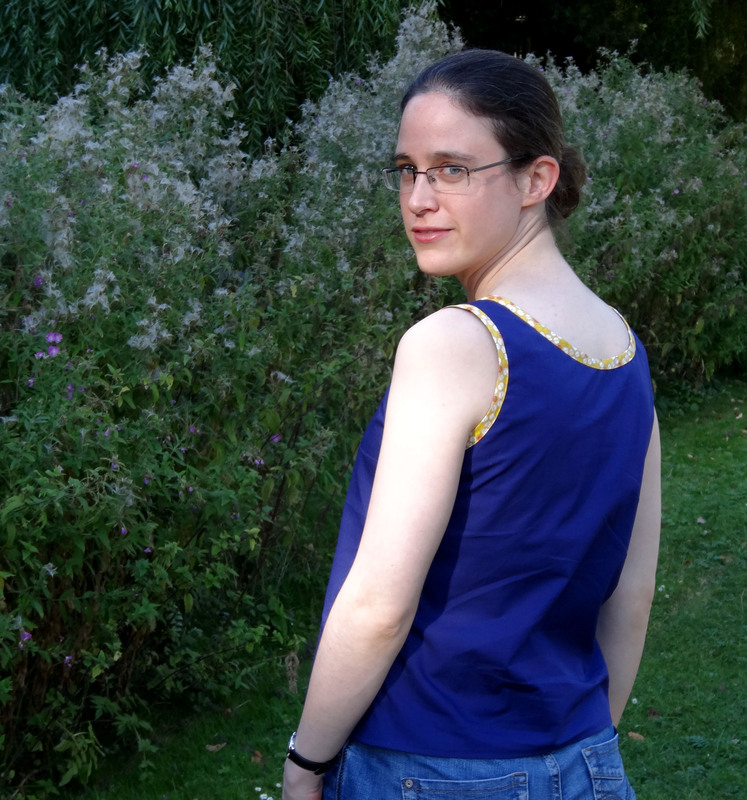 I am rather pleased with the fit, although if I were to make this top again I think I would lower the armholes a little since they are just a bit too tight. For the shoulder and side seams I used French seams. In Dutch, funnily enough, a French seam is called an English seam, which makes me wonder what it is called in French… These seams make the inside of the garment look much tidier and with this top there are only 4 seams that require finishing so it doesn’t even take that much longer to complete the garment. Overall I am happy with how this top turned out. In the future I will definitely try another Colette pattern as I thought the PDF pattern was easy to assemble and the instructions were very clear.